The impact of NC State’s campus community centers is felt far beyond the few hundred square feet they occupy. The centers prepare students to live, work and thrive in our diverse world. They provide support for underrepresented groups to succeed on campus and finish their degrees here. Above all, they help you find your authentic self and carry it with you wherever you go. NC State’s main campus is home to four community centers: the African American Cultural Center, the GLBT Center, Multicultural Student Affairs and the Women’s Center. In 2011, a strategic realignment placed them all under the Office of Institutional Equity and Diversity (OIED). Since then they’ve seen increased collaboration, collective programming and a renewed focus on intersectionality. “We’re now looked upon as a model for other universities due to our combined power as a unit, blazing a trail and learning as we go,” says Elizabeth Snively, OIED’s senior communications technologist. According to Adrienne Davis, the centers’ associate director, every student should feel welcome, even if they don’t identify with the group a particular center serves. “All centers, and the students, faculty and staff that find a home in them, want allies and accomplices that are willing to push the limits of their own understanding and stand up as advocates,” she says. When students take on these roles, they’re also preparing for a diverse global workforce. Companies are seeking employees equipped to learn about and connect with those who are different from them. And the skills the centers impart to students — how to promote inclusivity and critically engage with the world around them — are invaluable. “You’d be surprised at what you can learn about yourself when you step out of your comfort zone and expand your circle,” adds Davis. The Women’s Center’s peer educators program, The Movement, hosts a student workshop. Since its founding in 1991, the Women’s Center has fostered a community of allies and leaders pursuing gender equity and social justice on NC State’s campus. 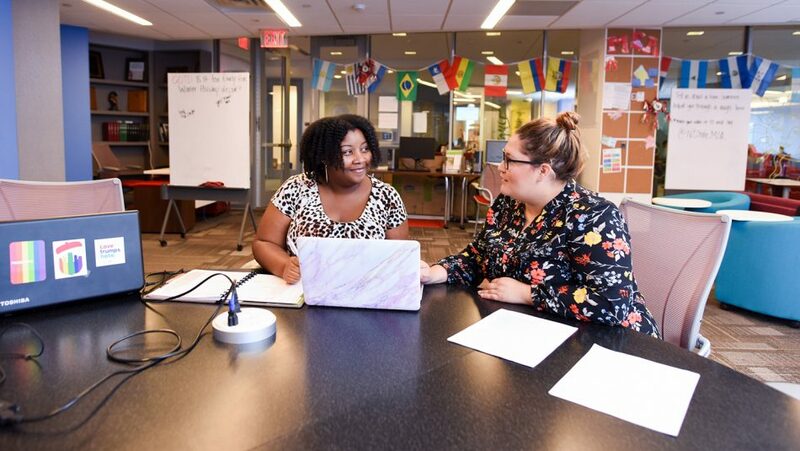 Located on the fifth floor of Talley Student Union, it also serves as a vital outlet for students, according to associate director Janine Kossen. “It’s a place to study, to relax, to sit in community with each other, to get to know each other, to be yourself in a place that feels comfortable and safe,” she says. The center is behind popular events like NC State’s Chocolate Festival, where attendees sample local confections and support the Kay Yow Cancer Fund. Its annual Gender and Equity Research Symposium draws in scholars from across the Triangle to present their work. Additionally, the center hosts events shedding light on interpersonal violence during Domestic Violence Awareness Month in October and Sexual Assault Awareness Month in April. With walk-in support services, the Women’s Center can be a first step for survivors of sexual assault to get help. Students dealing with violence — regardless of gender or sexual orientation — will find trained advocates who can lend an ear or walk them through their options. 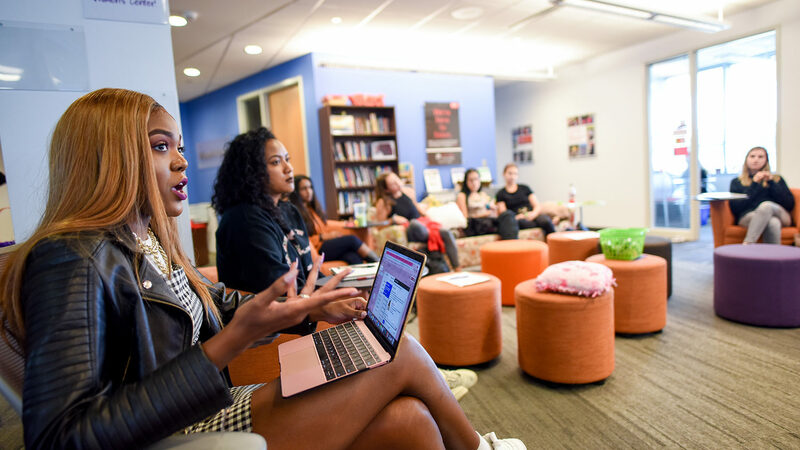 The center also offers events, trainings and workshops that encourage all students to thoughtfully engage with issues of gender, equity and interpersonal violence — and become leaders in the conversation. One such event, Feminist Fridays, has students develop and lead their own discussions each week. They cover everything from sports to design to engineering — and glean new understanding of how gender and social equity issues shape the world around them. Staff Leah Young and April Hammonds work together in the lobby of Multicultural Student Affairs. When you’re a student from an underrepresented group, finding your footing on a college campus can feel challenging. But knowing there’s a community behind you makes a difference. Multicultural Student Affairs (MSA) seeks to cultivate that community — and bolster student success. From the fourth floor of Talley Student Union, MSA develops programs to promote academic success, retention and graduation of NC State students. While all are welcome in the center, it serves a unique role for underrepresented populations on campus, with an emphasis on African-American, Native American and Hispanic students. That support network can be critical to a student’s success at NC State. It’s so important, in fact, that students are encouraged to start building their networks before classes begin. MSA’s annual Symposium for Multicultural Scholars is an overnight program that invites incoming first-year and transfer students from underrepresented populations to get acquainted with the center and other resources on campus. Newcomers can also link up with current students through MSA’s mentorship program, working together to remove barriers and succeed academically. We want everything that makes you you in this space. The center works with units across campus — including the College of Veterinary Medicine, NC State Libraries and the Study Abroad Office — to spread cultural programming. Through a partnership with the Mexican consulate, student staff also work with local spanish-speaking and Latinx communities. And the Read to L.E.A.D. program encourages students to mentor at local elementary and middle schools — with the goal of promoting diversity and equity through literacy. In the end, seeing students cross the finish line at the Multicultural Graduation Celebration is when the center’s work all comes together. The center’s staff in their office on the third floor of Witherspoon Student Center. From left to right: Moses T. Alexander Greene, John Miller IV, Tonya Hines and Angela Jenkins (Not pictured: Sachelle Ford). At its core, the African American Cultural Center is an academic unit: It’s designed to inspire the critical examination and exploration of African-American and other African diaspora cultures. 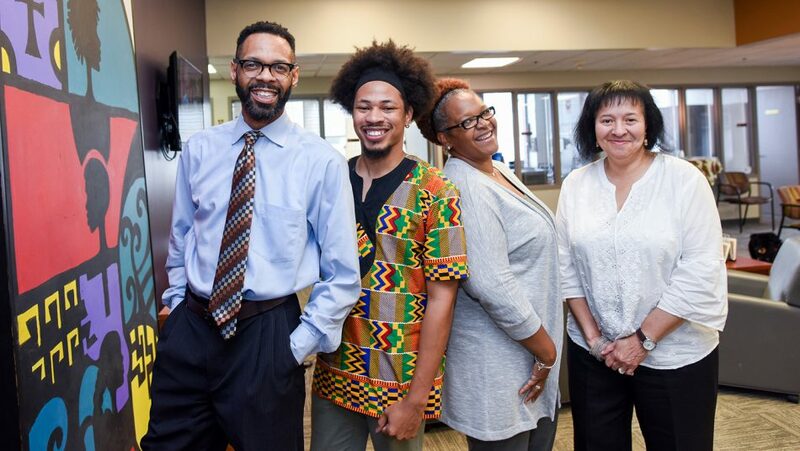 John Miller IV, the center’s program coordinator, believes that when students learn about the history of African diaspora and celebrate African-American culture, they ultimately uncover more about who they are. Hosting the 2018 Kwanzaa stamp dedication is part of the center’s decadeslong legacy of excellence. The center helps students build this foundation through a wealth of resources. Spanning three floors of Witherspoon Student Center, it includes an art gallery and a library brimming with more than 7,000 titles. The center — and its commitment to education — drew national attention earlier this month as NC State hosted the unveiling of the United States Postal Services’ 2018 Kwanzaa stamp. Other important events include Harambee — a Swahili word meaning “let’s come together” — which kicks off each new school year. The center also hosts campuswide celebrations of Kwanzaa and Martin Luther King Jr. Day as well as a popular African Diaspora Film Series. And the annual Blacks in Wax Live Museum draws visitors from across the state to watch students re-enact pivotal moments in African-American history. Miller, who graduated from NC State with a bachelor’s degree in psychology in 2015 and a master’s in higher education in 2017, says the mentorship and community he found in the center changed his life. Graduate student Christopher Moore spends an early morning studying in the GLBT Center. This February, the GLBT Center marked a decade of serving NC State students of all sexual orientations, gender identities and gender expressions. Overlooking the sunny rooftop garden on Talley’s fifth floor, the center is a welcoming environment for students to grow and cultivate their identities during the transitional years of college. 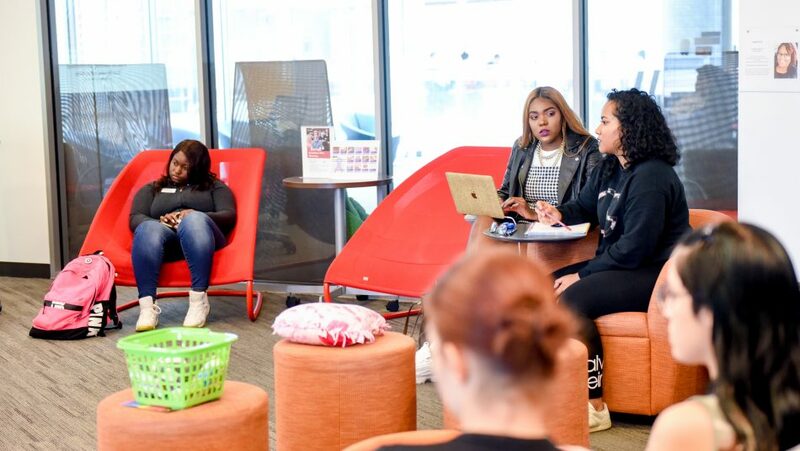 “Our space is for students to build, learn, create, feel safe and get to explore aspects of their identity they may not have yet,” says Preston Keith, the center’s assistant director. We want students who come to our center to know that we have their back — and the university has their back. Each year, students from the center head to Pride in Durham, NC; it’s often their first chance to express their identity in a public way with the university and their community behind them. The annual Lavender Graduation serves a similar purpose — and this year saw its largest number of participants ever. The GLBT Center also empowers students to take up roles as campus leaders — whether it’s through educating their peers, joining student government or being tapped for other leadership roles on campus. “Our students see themselves for the first time as student leaders when they come to our spaces. We tell them, ‘You can make a difference, and you will make a difference,’” says Keith. The GLBT Center offers more than 50 workshops each year and helps units across campus take part in conversations relating to identity, diversity and advocacy. Staff from the center have also trained corporations, nonprofit agencies and state agencies throughout North Carolina. Now in its fourth year, the GLBT Advocate Program recognizes faculty and staff who regularly attend workshops and events at the center — and who commit to advocating for inclusive policies and practices. In affirming the identities of GLBT students and empowering the entire Pack to advocate for equity and inclusion, the center sends an important message. “We want students who come to our center to know that we have their back — and the university has their back — as they go from the first day of class to graduation day,” says Keith.